Prenatal stress (PS) induces learning deficits and anxiety-like behavior in mouse pups by increasing corticosterone levels in the dam. We examined the effects of maternal chewing during PS on arginine vasopressin (AVP) mRNA expression in the dams and on neurogenesis, brain-derived neurotrophic factor (BDNF) mRNA expression, learning deficits and anxiety-like behavior in the offspring. Mice were divided into control, stress and stress/chewing groups. Pregnant mice were exposed to restraint stress beginning on day 12 of pregnancy and continuing until delivery. Mice in the stress/chewing group were given a wooden stick to chew during restraint stress. PS significantly increased AVP mRNA expression in the paraventricular nucleus (PVN) of the hypothalamus in the dams. PS also impaired learning ability, suppressed neurogenesis and BDNF mRNA expression in the hippocampus, and induced anxiety-like behavior in the offspring. Chewing during PS prevented the PS-induced increase in AVP mRNA expression of the PVN in the dams. Chewing during PS significantly attenuated the PS-induced learning deficits, anxiety-like behavior, and suppression of neurogenesis and BDNF mRNA expression in the hippocampus of the offspring. Chewing during PS prevented the increase in plasma corticosterone in the dam by inhibiting the hypothalamic-pituitary-adrenal axis activity, and attenuated the attenuated the PS-induced suppression of neurogenesis and BDNF expression in the hippocampus of the pups, thereby ameliorating the PS-induced learning deficits and anxiety-like behavior. Chewing during PS is an effective stress-coping method for the dam to prevent PS-induced deficits in learning ability and anxiety-like behavior in the offspring. A growing body of evidence suggests that the prenatal period is a critical time for neurodevelopment and is thus a period of vulnerability for exerting long-term effects on brain development and behavior, which is closely related to physical and psychiatric health. Clinical studies indicate that a pregnant women's exposure to traumatic stress, as well as to chronic and common life stressors puts her offspring at risk for behavioral and emotional problems . Developmental impairment of the brain due to prenatal stress (PS) is well established in rodents and is generally associated with anxiety, and depression-like behaviors, and cognitive deficits in the offspring throughout life [2-4]. PS leads to suppression of neurogenesis in the hippocampal dentate gyrus (DG) [2, 3, 5], and decreased in brain-derived neurotrophic factor (BDNF) expression in the hippocampus  in the offspring. Corticotropin-releasing hormone (CRH) and arginine vasopressin (AVP) are considered important for mediating the hypothalamic-pituitary-adrenal (HPA) axis in response to stress . Although acute stress markedly increases CRH mRNA expression, changes in AVP mRNA expression are less marked  in the paraventricular nucleus of the hypothalamus (PVN). In repeated or chronic stress conditions, CRH mRNA expression may increase, decrease, or remain unchanged [9-11]. After repeated stress, the CRH rapidly adapts . AVP plays more important roles than CRH in sustaining HPA axis activity during repeated or chronic stress . New neurons are produced throughout life in the subgranular zone of the hippocampal DG and the subventricular zone of the lateral ventricle . Hippocampal neurogenesis comprises three biologic processes, cell proliferation, differentiation, and survival . Approximately 80% of newborn cells move into the granule cell layer, mature into neurons [14, 15], extend axonal connections to CA3, and are functionally integrated into hippocampal neural circuitries , involved in hippocampal-mediated learning , anxiety, and emotional behavior [18, 19]. This neurogenesis is strongly influenced by various hormonal and environmental stimuli, such as stress or an enriched environment [20-22]. BDNF is a member of the neurotrophin family of growth factors, which are related to the canonical nerve growth factor, and is considered an important protein that influences brain function as well as the peripheral nervous system. BDNF regulates synaptic transmission, activity-dependent plasticity , and neurogenesis in the hippocampal DG [24, 25]. The clinical relationship between BDNF and mild cognitive impairment is understood , and BDNF is a potential biomarker for anxiety related to depression . Stress-exposed animals exhibit reduced BDNF expression in the hippocampus, and depressed patients have decreased brain and blood levels of BDNF [28, 29]. Chewing is an effective stress-coping behavior [30-32]. In humans, gum chewing relieves stress and improves task performance, and in rodents chewing or biting under restraint or immobilization stress ameliorates stress-induced diseases such as gastric ulcer, and osteoporosis, and attenuates stress-induced cognitive and emotional impairment [30, 33-35]. Chewing under restraint stress rescues the increase in plasma corticosterone levels, deficits in spatial learning ability , and suppression of cell proliferation in the hippocampal DG . Recently, we reported that chewing during PS ameliorates PS-induced learning deficits by decreasing plasma corticosterone levels in the dam . The mechanism underlying the inhibitory effects of chewing during PS in the dam on PS-induced hippocampal behavioral and morphologic changes in the offspring has not yet been fully clarified. Here we examined the effects of chewing during PS on AVP expression in the dam, and on the survival/differentiation and proliferation of newborn cells in the hippocampal DG, BDNF mRNA expression in the hippocampus, and learning ability and anxiety-like behavior in the offspring. DDY mice were purchased from Chubu Kagaku Shizai Co. Ltd. (Nagoya, Japan) and housed under standard laboratory conditions (12-h light/dark cycle, controlled temperature (23 ± 1°C) and humidity) with food and water available ad libitum. Pairs of male and female mice were matched overnight (the next day was designated gestational day 0), and then female mice were placed in individual cages and randomized to control (C, n=8), stress (S, n=8), or stress/chewing (S/C, n=8) groups. All experiments were performed according to the guidelines for the care and use of laboratory animals of Asahi University and Seijoh University. The ethics committee of Asahi University School of Dentistry and Seijoh University approved the study. Pregnant females in the S and S/C groups were individually restrained for 45 min, 3 times a day during the light phase in plastic transparent cylinders (4.5 cm diameter, 10.3 cm long), in which they could move back and forth but not turn around, under bright light exposure from day 12 until delivery. Pregnant mice in the S/C group were allowed to chew on a wooden stick (diameter, ~2 mm) during the restraint period. Mice in the C group were not restrained and remained in their home cages. After birth, the offspring were raised by their biologic mothers until weaning. At weaning, male pups were randomly selected from the C, S, and S/C groups and assigned to the CC, SC, and S/CC groups, respectively, and housed in groups of five under standard laboratory conditions. Mice were placed on the hole-board apparatus (400 mm x 400 mm x 20 mm, Model No. 6650, BrainScience Idea Co. Ltd, Osaka, Japan) with 16 holes (3 cm diameter) in a grid-pattern. An infrared beam sensor was installed on the wall to detect the number of head-dipping behaviors, and the latency to the first head-dips. Mouse behavior was recorded by an overhead color CCD camera linked to a computer system (Move-er/2D, Library Co., Ltd., Tokyo, Japan). One muse (n=5/group) was placed on the floor of the hole-board and allowed 5 min to explore the board, and the time to the first head-dip, number of rearings and head-dips, and distance travelled were measured as described previously . The Morris water maze test was performed as described previously [38, 40], using a stainless steel circular pool (diameter, 90 cm; height, 30 cm) filled to 23 cm with water (~23℃) . One mouse (n=5/group) was placed in the water from 1 of 4 randomly selected quadrants of the pool and allowed 90 s to locate a platform (12x12 cm, 1 cm under the surface) placed in the center of one of the quadrants, and given four acquisition trials per day for 7 days. Escape latency and swim path were recorded for each trial using a CCD camera linked to a computer system (Move-er/2D, Library Co., Ltd., Tokyo, Japan). All animals underwent a visible probe test 2 h after the last training trial on the last day of training. The mice (6/group) were anesthetized with pentobarbital sodium and perfused transcardially with 30 ml of saline, followed by 100 ml of 4% paraformaldehyde in 0.1 M phosphate buffer, pH 7.4. The brains were removed and placed in 4% paraformaldehyde fixative overnight. The in situ hybridization method used in this study was described previously . Briefly, 3-μm thick sections were treated with 2 μg/ml proteinase K for 15 min at 37℃. After post-fixation, the sections were treated with 0.2N HCl, and acetylated with 0.25% acetic anhydride in 0.1 mol/l triethanolamine (pH 8.0) for 10 min each. After treatment with 3% hydrogen peroxide for 1 h, sections were dehydrated and air-dried. The hybridization mixture (50 μl; mRNA In situ Hybridization Solution; Dako) with 50 ng cRNA probes  was loaded onto each section and hybridized for 16 to 18 h at 50℃. After hybridization, the sections were immersed briefly in 5xSSC (1xSSC: 0.15 mol/l NaCl and 0.015 mol/l sodium citrate), and washed in 50% formamide/2xSSC for 30 min at 55℃. The sections were then rinsed in TNE (10 nmol/l Tris-HCl, pH 7.6; 1 nmol/l EDTA, 0.5M NaCl) for 10 min at 37℃, and treated with 10 μg/ml RNase A (Roche Diagnostics) for 30 min at 37℃. After rinsing again in TNE for 10 min at 37℃, the sections were washed sequentially in 2x-SSC, 0.2xSSC, and 0.1xSSC for 20 min each at 55℃. The sections were then rinsed in TBS(2)-T(0.01 mol/Tris-HCl, pH 7.5; 300 nmol/l NaCl, 0.5% Tween-20) three times for 5 min each, and in 0.5% casein/TBS (0.01 mol/l Tris-HCl pH 7.5, 150 nmol/l NaCl) for 10 min, and reacted with 1:400 diluted horseradish peroxidase-conjugated rabbit anti-DIG F(ab') fragment antibody (Dako), 0.07 μmol/l biotinylated tyramide solution, and 1:500 diluted horseradish peroxidase-conjugated streptavidin (Dako) for 15 min each at room temperature. Finally, the color was developed using the DAB Liquid System (Dako) and the sections were counterstained with Mayer's hematoxylin. Hybridization with a β-2-microgloblin antisense strand probe was used as an internal control to confirm preservation of the mRNA. Hybridization with a CRH or AVP sense stand probe was used as a negative control. AVP mRNA signals in the PVN (bregma: -0.70 mm to -0.94 mm) using the atlas of Franklin & Paxinos  were quantitatively analyzed in all sections under a microscope with a 20x objective, as described previously . Image analysis was performed with Image J 1.32 software (W. Rasband, National Institutes of Health, zippy.nimh.nih.gov). The density of the AVP mRNA signals in the PVN was determined in a circular region (0.21mm) with the highest density of CRH and AVP mRNA signals. The highest mean densitometric score in each hemisphere was determined by averaging four consecutive coronal sections. These same sections were used to evaluate the regional AVP mRNA density in the PVN. The highest mean density AVP mRNA scores obtained from each hemisphere were summed and averaged for each control and stressed animal. Similar paired comparisons were made to evaluate differences in the regional size of the AVP mRNA-expressing fields. For immunohistochemical analysis of cell proliferation, survival, and differentiation, 5-bromo-2'-deoxyuridine (BrdU; 50 mg/kg; 10 mg/ml dissolved in 0.9% NaCl, Sigma-Aldrich, St. Louis, MO) was intraperitoneally injected 5 times a day at 3-h intervals . The next day (for proliferation, n=6/group) or 24 days (for survival, n=6/group) after BrdU injection, the mice were anesthetized with sodium pentobarbital, perfused transcardially with saline followed by 4% paraformaldehyde, and the brains were dissected out and placed in 4% paraformaldehyde at 4°C and cryoprotected in a 30% sucrose solution until sectioned. The hippocampal sections (40 μm thick) were prepared on a cryostat (CM1850, LEICA, Wetzlar, Germany). For DNA denaturing, the sections were incubated at 65°C for 2 h in 50% formamide/2x saline sodium citrate (0.3 M sodium chloride and 0.03 M sodium citrate), incubated for 30 min in 2 N HCl at 37°C, and neutralized for 10 min in 0.05 M Tris-buffered saline (TBS, pH 8.5). The sections were rinsed with phosphate-buffered saline (PBS, pH7.4), incubated with 1% H2O2 for 10 min, rinsed with PBS, and incubated for 60 min with 5% normal goat serum using the ABC method. The sections were rinsed again with PBS and incubated with rabbit polyclonal anti-BrdU antiserum (Abcam PLC, Cambridge, UK) diluted 1:200 in PBS containing 0.3% Triton X-100 at 4°C for 48 h, rinsed with PBS, and then incubated with biotinylated goat anti-rabbit IgG (Dako Cytomation, Glostrup, Denmark) diluted 1:500 in PBS for 2 h. After rinsing with PBS followed by 0.05 M Tris-HCl buffer (pH 7.6), sections were incubated with peroxidase-conjugated streptavidin (Dako Cytomation) diluted 1:500 with TBS for 1 h. Visualization of the bound complex was achieved using 3,3'-diaminobenzidine (0.5 mg/ml) and hydrogen peroxidase (0.01%) in TBS. 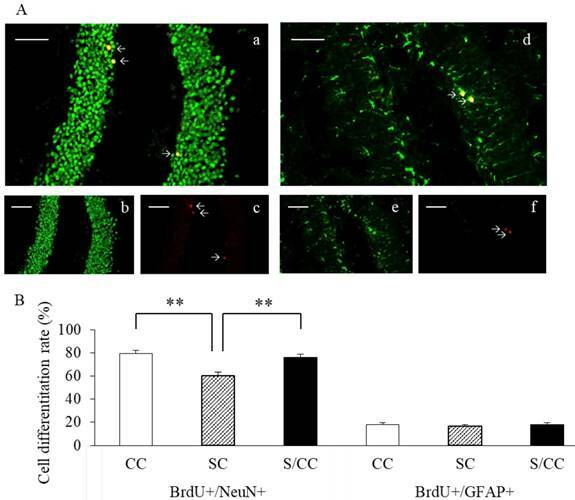 To evaluate newborn cell differentiation, the mice (n=6/group) were perfused 21 days after the BrdU injections, and double immunofluorescence staining was performed to determine the colocalization of BrdU with neuronal nuclei (NeuN) or glial fibrillary acidic protein (GFAP), as previously described . After denaturing the DNA as described above, sections were incubated with a sheep polyclonal anti-BrdU antibody (1/200; Abcam) and rabbit polyclonal anti-GFAP antibody (1/1000; Millipore, Billerica, MA) or with mouse monoclonal anti-NeuN antibody [1/100; Millipore]. Bound anti-BrdU was visualized with donkey anti-sheep IgG, fluorescein isothiocyanate (FITC) conjugate (1/100; Santa Cruz Biotechnology, Dallas, TX); anti-GFAP was visualized using donkey anti-rabbit JgG FITC conjugate [1/100; Santa Cruz Biotechnology], and anti-NeuN antibodies were visualized using donkey anti-mouse IgG FITC conjugate (1/100; Santa Cruz Biotechnology). To quantify BrdU-positive cells in the hippocampal DG, every 6th section (120-μm apart) of the series was selected and 8 sections for each mouse were quantified (bregma -2.12 mm to -6.30 mm)  using an unbiased stereologic method under a microscope with 4x objective (Olympus BX-50, Japan) as previously described . At least 50 BrdU-labeled cells were measured in each brain, and the number of double-labeled cells was expressed relative to the total number of BrdU-positive cells . After decapitation under anesthesia, the mouse hippocampus (6/group) was removed from the brains and pooled. Hippocampi were stored in either TRIzol RNA Isolation Reagents (Invitrogen, Carlsbad, USA) for determination of Bdnf mRNA expression and stored at-80°C for determination of Bdnf expression. Real-time PCR was performed on ABI PRISM® 7500 Real Time PCR system (Applied BioSystems) using SYBR® Premix Ex TaqTM II (TaKaRa). The mRNA expression levels were normalized using glyceraldehyde 3-phosphate dehydrogenase (Gapdh). RNA isolation and reverse transcription- polymerase chain reaction were performed as described previously . Mouse cDNA synthesis was performed the using PrimeScriptTM RT Reagent Kit (TaKaRa) according to the manufacturer's protocol. The primer sequences for Bdnf and Gapdh are listed in Table 1. Each sample [n=6] was run in duplicate and repeated three times. To normalize mRNA expression, housekeeping genes (Gapdh) were selected as the internal control. All data are represented as mean±SE. Analysis of variance or factorial analysis of variance were used to analyze the data, followed by Tukey's post hoc multiple comparison tests to evaluate the statistical significance of the behavioral or morphologic differences between groups. A P value of less than 0.05 was considered significant. Typical photomicrographs of AVP mRNA signals in the PVN and the incidence of AVP mRNA signals are shown in Figure 1A and 1B. AVP mRNA expression in the PVN differed significantly between the C, S, and S/C mice [F(2, 29)=49.9575, P<0.01]. AVP mRNA expression in the S group was 296% (P<0.01) and 267% (P<0.01) higher than that in the C and S/C groups, respectively. No significant difference in AVP mRNA expression was detected between the C and S/C groups. Rearing counts differed among the three groups [F(2, 14)=18.483, P<0.01]. Rearing counts were larger in the SC group than those in CC (P<0.01) and S/CC (P<0.05) groups. 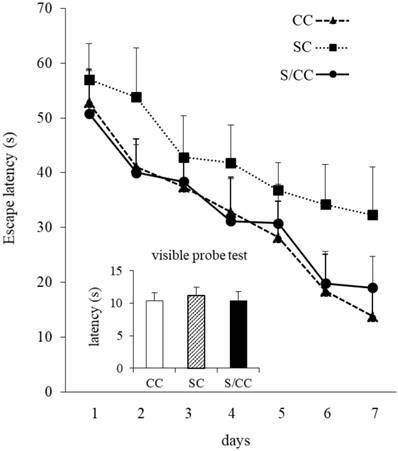 No significant difference in rearing counts was detected between the CC and S/CC groups (Fig. 2A). Distance travelled differed among the three groups [F(2, 14)=100.4905, P<0.01]. Distance travelled was longer in the SC group than that in the CC (P<0.01) and S/CC (P<0.01) groups. No significant difference in distance travelled was detected between the CC and S/CC groups (Fig. 2B). Photomicrographs showing vasopressin mRNA signals in the PVN (1A), the effect of chewing during PS on AVP mRNA expression in the PVN (1B). Mean [±SE] AVP expression in C, S, S/C groups [n=6/group]. The graph shows the change relative to the C group, with the C group used as a base of 100% (1B). Bars: 100 μm, **: P<0.01. Note the increase in AVP mRNA expression in the S group compared to the C and S/C groups. Effects of chewing during PS on the hole-board test performance, i.e., Rearing (2A), Distance travelled (2B), Head-dip counts (2C), and Head-dip latency (2D). The results are expressed the mean count or time [mean±SE, n=5 for each group]. **: P<0.01, *: P<0.05. Note the greater reduction in the rearing, moving distance, head-dip counts, head-dip latency in the S group. The number of head-dips differed significantly between groups [F(2, 14)=17.0294, P<0.01] (Fig. 2C). 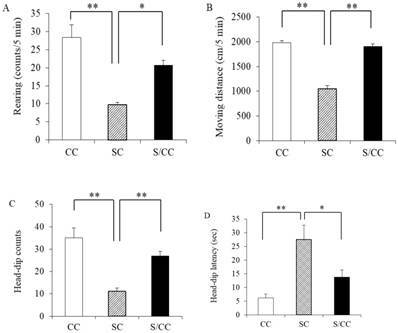 The number of head-dips was lower in the SC group than that in the CC (P<0.01) and S/CC (P<0.01) groups, but there were no significant difference in the time to the first-head-dip between the CC and S/CC groups Fig. 2C). Time to the first head-dips differed significantly among the three groups [F(2, 14)=10.0193, P<0.05] (Fig. 2D). Time to the first head-dips was longer in the SC group than in the CC (P<0.01) and S/CC (P<0.05) group, but no significant difference in the time to first head-dips was detected between CC and S/CC groups (Fig. 2D). Water maze performance improved in all mice during acquisition, as indicated by the reduced mean escape latency over the 7 training days [F(6, 72)=32.063, P<0.01](Fig. 4). The escape latencies of the mice differed significantly among the three groups [F(2, 12)=17.029, P<0.01]. Escape latencies were significantly longer in the SC group than in the CC and S/CC groups, but no significant difference was detected between the CC and S/CC groups. Performance in the visible probe test did not differ significantly among groups. The number of proliferating cells differed significantly among the three groups (F(2, 17)=1935.428, P<0.01] (Fig. 4A). The SC group had significantly fewer BrdU positive cells than the CC (P<0.01) and S/CC (P<0.01) groups, but no significant difference in the number of BrdU-positive cells was detected between the S/CC and CC groups. The number of surviving cells differed significantly among the three groups [F(2, 17)=16.8992, P<0.01] (Fig. 4B). The number of surviving cells was lower in the SC group than in the mice CC (P<0.01) and S/CC (P<0.01) groups, but no significant difference in the survival of newborn cells was detected between the CC and S/CC groups. The phenotype of mature BrdU-positive cells was determined based on BrdU double-labeling with either NeuN or GFAP (Fig. 5A). The majority of BrdU-positive cells were immunoreactive for NeuN in the CC (79.1%), SC (60.3%), and S/CC (76.2%) groups. The amount of NeuN immunoreactivity was significantly different between the three groups [F(2, 18)=13.1093, P<0.01]. The amount of NeuN immunoreactivity was significantly lower in the SC group, than in the CC (P<0.01) and S/CC (P<0.01) groups. No significant difference in the amount of NeuN was detected between the CC and S/CC groups. The number of BrdU-positive cells immunoreactive for GFAP did not differ significantly among the three groups (CC, 18.1%; SC, 16.5%; S/CC, 18.0%) [F(2, 17)=0.3748, P=0.69]. These results suggest that chewing during PS increases cell differentiation into neurons. Spatial learning in the Morris water maze test. The results are expressed as the mean score [mean±SE, n=5/group] of four trials per day. Note that the S group required a longer time to reach the platform. BDNF mRNA expression in the hippocampus of the three groups is shown in Fig. 4A significant difference was detected in BDNF mRNA expression among the three groups [F(2, 17)=16.604, P<0.01]. The hippocampal BDNF mRNA expression was decreased in the SC group by 32.1% (P<0.01) and 28.9% (P<0.01) compared with CC and S/CC groups, respectively. 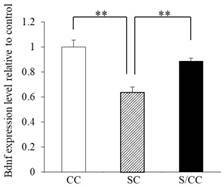 The hippocampal BDNF mRNA expression did not differ significantly between CC and S/CC groups. In the present study, we found that chewing during PS prevented not only stress-induced AVP expression in the PVN in the dam, but also ameliorated the PS-induced suppression of proliferation, survival, and differentiation of newborn cells in the hippocampal DG, and the decrease in BDNF mRNA expression in the hippocampus in the offspring. In offspring whose dams were allowed to chew on wooden sticks during restraint stress, PS-induced anxiety-like behavior and learning deficits were also attenuated. The morphologic and behavioral changes in dams in this study were consistent with the changes in plasma corticosterone levels in our previous reports [38, 40]. Representative dual immunofluorescence micrographs of BrdU and NeuN (a-c) or GFAP (d-f) in the hippocampal DG (4A). Colocation of BrdU (red, b and e) and NeuN (green, c) or GFAP (green, f) and the merged image (a and d). Bars: 100 μm. The percentage of newly generated cells [mean±SE, n=6 for each group] (4B). The percentage of BrdU+/NeuN+ cells was significantly decreased in the SC group. The percentage of BrdU+/GFAP+ cells did not differ significantly among the three groups. Effects of chewing during PS on cell proliferation (5A) and survival (5B) of newborn cells in the DG of hippocampus. The results are expressed the mean number of BrdU-positive cells [mean±SE, n=6 for each group]. **: P<0.01. Note the greater reduction in cell proliferation and survival of newborn cells in the DG in the SC group. Effects of chewing during PS on quantitative PCR BDNF expression levels. Mean [±SE] BDNF mRNA expression in the C, S, S/C groups [n=6/group]. The graph shows the change relative to the C group, with the C group used as a base of 100%. **: P<0.01. Note the decrease in BDNF mRNA expression in the S group compared with the C and S/C groups. Maternal exposure to various types of stress during pregnancy impairs brain development in the offspring, resulting in wide-ranging and long-lasting effects on their brain function and behavior. Some types of psychiatric and behavioral disorders in humans have developmental origins [48, 49], and prenatal stress in rodents dramatically induces anxiety- and depressive-like behavior in offspring throughout the lifetime [50, 51]. Glucocorticoid is a key mediator regulating prenatal stress and dysfunction of the negative feedback control of the HPA axis by glucocorticoid exposure during pregnancy in the offspring increases the risk for developing psychiatric disorders and cognitive deficits [52, 53]. The response of the HPA axis to novel stress is enhanced in prenatally stressed offspring, which increases their vulnerability to neuropsychiatric disorders . The stress-induced vulnerability is supported by findings of a stress-induced reduction of hippocampal mineralocorticoid and glucocorticoid receptor mRNA expression . The elevated plasma corticosterone levels and AVP expression observed in this study are very similar to findings of previous studies in which plasma corticosterone levels and AVP expression in the PVN were increased under chronic stress conditions [38, 56, 57]. CRH and AVP are secreted from parvocellular neurons of the PVN and control the plasma corticosterone levels via the HPA axis in response to internal or external environmental changes, including stress. Both CRH and AVP mRNA expression levels are increased in acute stress conditions . The response of CRH mRNA to repeated or chronic stress, however, is much more complex. Depending on the stress paradigm, the expression of CRH mRNA levels in the hippocampus may increase, decrease, or remain unchanged [9, 10, 58]. The response of AVP plays a much more prominent role in regulating HPA axis activity during repeated or chronic stress compared with the CRH response [9, 59]. Stress-induced increases in the plasma corticosterone levels and phosphorylation of extraventricular signal-related protein kinase 1/2 [pERK1/2] induction and CRH expression in the PVN is attenuated by chewing during repeated restraint and acute immobilization stress [37, 60 61]. The stress-induced decrease in glucocorticoid receptor expression in the hippocampal CA1 region is attenuated by chewing during the immobilization stress . In addition, providing the dams with wooden sticks to chew during prenatal stress inhibits the stress-induced increase in plasma corticosterone levels in the dam . In the present study, restraint stress increased plasma corticosterone levels and AVP mRNA expression, and chewing during restraint stress attenuated the increase in the plasma corticosterone levels and AVP mRNA expression in the PVN in the dams. These findings suggest that restraint stress acts as a chronic stressor and chewing during prenatal stress ameliorates the stress response in the dams, thereby attenuating the stress-induced leading deficits and anxiety-like behavior in the offspring. The hippocampus has a low tolerance for stress. Neurogenesis occurs in the hippocampus throughout adulthood and these newborn neurons are integrated into the hippocampal neuronal circuitry and contribute to hippocampal function . Hippocampal neurogenesis regulates various cognitive processes such as learning and memory, as well as anxiety and emotional behavior [18, 19, 63, 64]. Hippocampal neurogenesis is influenced by various internal and external environmental changes. 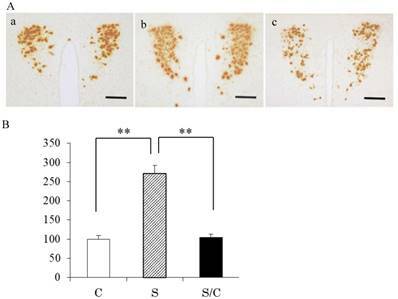 Excessive glucocorticoids reduce neurogenesis in the hippocampus  and an enriched environment such as voluntary wheel running enhances hippocampal neurogenesis [21, 22]. BDNF is a secreted protein that regulates neuronal development and function, and is predominantly expressed in the hippocampus, cerebral cortex, and amygdala . BDNF controls neuronal plasticity and is implicated in neurogenesis in the hippocampal DG, learning ability, and anxiety disorders [24, 25]. Prenatal stress in animals leads to increased anxiety- and depressive-like behavior, and learning deficits [5, 3], and suppression of hippocampal DG neurogenesis in offspring [3, 66]. Prenatal stress perturbs BDNF biosynthesis in the hippocampus of the offspring, but the precise effects are not clear. Some studies report a reduction in hippocampal BDNF protein, while others indicate that BDNF protein levels in the hippocampus are increased in PS offspring [67, 68]. In the present study, we found that PS suppressed BDNF mRNA expression in the offspring hippocampus, induced learning impairments and anxiety-like behavior. These discrepancies may be due to differences in the age of the offspring and the experimental methods used such as the type of stress. Chewing during PS increased BDNF mRNA expression in the hippocampus, and suppressed PS-induced learning deficits and anxiety-like behavior, and neurogenesis in the hippocampal DG in the offspring. Therefore, allowing the dams to chew on a wooden stick during PS may protect against PS-induced deficits in learning ability and anxiety-like behavior by attenuating the effects of stress on neurogenesis and BDNF mRNA expression in the hippocampus of the offspring. The medial prefrontal cortex (mPFC) and amygdala are directly connected. Both structures are involved in regulating stress-related responses and modulating hippocampal function, such as learning and memory, and psychiatric behavior [69, 70]. The locus coeruleus contains the largest groups of noradrenergic neurons in the central nervous system, and plays a role in promoting behavioral adaptation to stress . The locus coeruleus innervates the cerebral cortex of both hemispheric lobes and limbic areas, including the prefrontal cortex and amygdala, and is involved in neuroendocrine function by projecting neuroendocrine cells to the PVN [72, 73]. Noradrenergic and dopaminergic neuronal systems are modulated by various types of stress and contribute to the pathogenesis of anxiety and cognitive deficits [74, 75]. Restraint stress activates noradrenergic neurons in the locus coeruleus , novelty exposure induces the preferential activation of the prefrontal cortical dopaminergic system , and tail pinch stress increases striatal dopaminergic activity . On the other hand, some reports indicate that chewing under stressful conditions suppresses the stress-induced changes in various areas of the central nervous system. Chewing under immobilizeation stress prevents a stress-induced increase in phosphorylated extracellular signal-related kinase in the periaqueductal gray with major cortical inputs from areas involved in emotional regulation, such as the mPFC and amygdala . Chewing in response to brief restraint stress attenuates the stress-induced reduction of gamma-aminobutyric acid-stimulated chloride uptake in the frontal cortex and amygdala after the stress exposure . Rats allowed to chew on a wooden stick while being exposed to restraint stress exhibited a suppressed stress-induced noradrenaline release in the amygdala . Dopamine activity in the right prefrontal cortex is modulated by coping processes and plays a critical role in stress-related actions in the prefrontal cortex . In addition, tail pinch stress increases striatal dopamine activity in rats, while non-functional masticatory activity during the stress attenuates the increase in striatal dopaminergic neurotransmission induced by the stressor . By measuring the brain levels of 3,4-dihydroxyphenylacetic acid, the major catabolite of dopamine, Berridge et al. found that chewing attenuates stress-induced dopaminergic utilization in the frontal cortex . Chewing during exposure to novelty stress induces an increase in Fos immunoreactivity in the right hemisphere of the mPFC, and a decrease in Fos-immunoreactivity in the right central nucleus of the amygdala, suggesting that coping by chewing under stressful conditions engages the neuronal activity of the mPFC and amygdala asymmetrically . Chewing during restraint stress increases dopaminergic activity in the hippocampus, which suppresses stress-induced anxiety-like behavior and long-term potentiation in the hippocampus . Together these findings suggest that neural mechanisms of coping with stress by chewing may be modulated by catecholaminergic-mediated suppression of the stress-induced activation of the mPFC and amygdala. Further studies are needed to clarify the neural mechanism of coping stress by chewing or biting during PS. The findings of the present study indicate that maternal chewing during PS effectively ameliorates stress-induced increases in plasma corticosterone levels in the dam decreasing AVP expression in the PVN, and, in the adult offspring, prevents PS-induced learning deficits, anxiety-like behavior, and impaired neurogenesis due to the suppression of BDNF mRNA expression in the hippocampus. This work supported in part by a Grant-in-Aid for Scientific Research (B) and Challenging Exploratory Research from the Ministry of Education, Culture, Sports, Science, and Technology of Japan (KAKENHI 22390395, 15K15761).